It’s a myth that laser hair removal is only for women. Men could use it, too – especially if they’re fit and want to show it. Athletes in many sports understand that body hair actually hides muscle definition. Ridding their back, chest, legs, and arms of hair allows others to notice all their muscles better. They know also that removing body hair gives them a competitive edge by increasing their speed and agility. Interested in undergoing laser hair removal treatments? Here’s everything you need to know about how it works, what your first session will be like, the type of results you can expect, and how to maintain those results. In laser hair removal laser light pulses strike the pigment melanin in a hair’s follicle. This damages the pigment enough to slow the hair regrowth — by a lot. 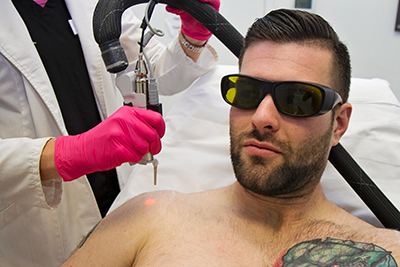 Because the lasers target melanin, coarse, dark hair, such as back and chest hair, and light skin combinations usually respond best to treatment. Have another hair–skin combo? No problem. You can still get excellent results with the Nd:YAG laser. It’s longer wavelength and improved pigment selectivity enable it to penetrate hair follicles more precisely, leaving the surrounding skin tissue undamaged. Yes. Cynosure and other next-gen lasers work with nearly all skin types and tones. Only red and gray hair are difficult to distinguish from surrounding skin. If you don’t have a high hair–skin color contrast, don’t worry. Laser hair removal options still exist for you. For instance, if you have light hair and skin, you can still achieve excellent results by dyeing your hair a shade darker prior to a laser hair removal procedure. Laser Hair Removal Testimonial from LaserAway on Vimeo. A laser hair removal session can last anywhere from a few minutes to several hours, depending on the size of the area to be treated. You’ll wear protective eye gear. And if you want, you can have a topical anesthetic. A stinging will tell you the laser has been activated. The discomfort isn’t bad, though. Clients have said that it feels like a rubber band snapping against their skin. You’ll see minor and temporary swelling and redness immediately after your session. But you’ll probably be able to get back to your normal activities right away. You’ll need to stay out of the direct sun and wear sunblock with a high SPF for several weeks afterwards. Rare complications include blisters, swelling, redness, and scarring. Even rarer are scarring or changes in skin color. 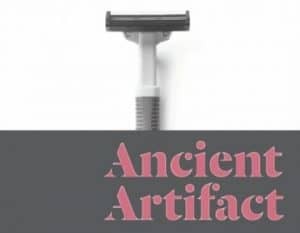 Safer and more permanent than plucking, shaving, electrolysis, and waxing, laser hair removal can reduce body hair by up to 90 percent. And this is just after three to five sessions. Best results require multiple laser hair removal sessions, because only hair in the actively growing stage is treatable. Laser hair removal removes hair from the back, chest, legs, face, and other large areas. Once you’ve rid the hair you want, you’ll notice greater muscle definition in the treated spots. Shave the day of your laser hair removal treatment. This will make it easier for your technician to find and target your hair follicles. And this boosts results and shortens session length. Avoid caffeine 24 hours prior to your laser hair removal session. Some clients have reported that forgoing caffeine reduces discomfort during sessions. Don’t wax the treated area for six weeks prior to your first laser hair removal session. This ensures that all of the follicles in the growth phase are targeted. Don’t tan, and be sure to use sunscreen consistently. You’ll want your skin to be as light as possible, since laser hair removal works best with high skin tone and hair color contrasts. Make sure to use sunscreen for at least two weeks before and after each session. Don’t wash with any abrasives for at least five days after your laser hair removal treatment. Avoid strenuous sports, activities, or hot water and saunas for three days after your laser hair removal treatment. After the first week following your laser hair removal session, be sure to gently exfoliate the treated area. Treated hairs will start to shed, and gently exfoliating the area helps them along. The time you spend trimming your body hair could be more time at the gym. Removing body hair boosts your athletic abilities by increasing speed and reducing resistance. This is especially handy if you’re a swimmer or cyclist. Plus, eliminating excess hair makes your body feel lighter and reduces any friction caused by clothing. If you’re prone to injuries, removing body hair can help. This is because, after hair is removed, wounds tend to heal quicker and band aids can be applied without getting stuck to body hair. Removing body hair reduces sweat. Without body hair, your body temperature drops, and you tend to sweat less. Offering the most aesthetic service options of any national skincare provider, we use only innovative techniques and cutting-edge laser technology. And our highly trained staff is experienced and certified in laser and other dermatological procedures. They strive to make your visit comfortable, enjoyable, and satisfying. Want to learn more about laser hair removal? Schedule a free, no-obligation consultation today by emailing LaserAway.com or calling us at LaserAway at (888) 965-2737.